Lowest preform eccentricity, not exceeding margin of 0.1mm. With precision, the hot runner system is designed with capability to gain ideal and prompt heating effect for preform production. 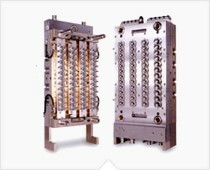 Such a hot runner system reduces the wear and tear of each mould as well as maintenance cost besides saving at least 15% electricity while in operation. The hydraulic ejection technique ensures quiet and also long service life of highest possible rating in terms of shots. Thus the PET bottles and jars made with the aid of such moulds have an enhanced shelf life.